Style with a little stand collar that goes round the back. A notch is located about midway between top button and the stand collar. A style very popular with sporting gentlemen with a little stand collar that goes round the back. 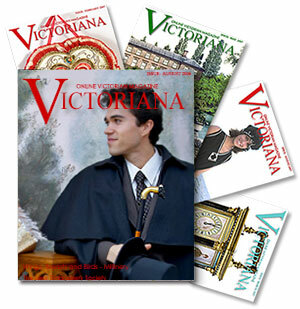 For a walk in the damp London fog, the Victorian gentleman would dress in a stylish overcoat. In the late 1890s, Victorian men were able to purchase their fall and winter coats from department store mail-order catalogues. Braces, or suspenders, were worn from the end of the eighteenth century to the beginning of the 20th century. Mid-nineteenth century braces were crafted in silk, canvas or velvet with silk or berlin woolwork embroidery.